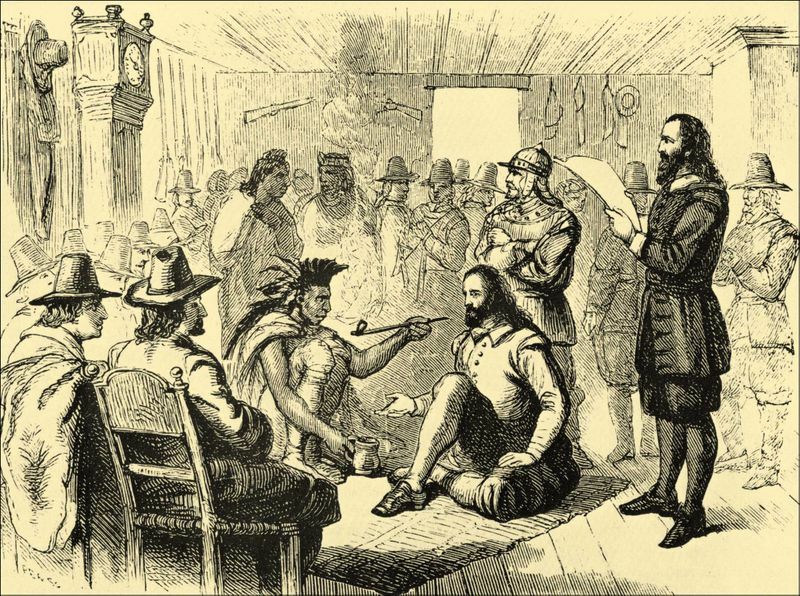 Massasoit, sachem (leader) of the Wampanoag Confederacy, and John Carver, governor of the Mayflower, smoke a peace pipe. Source: Sutro Library, San Francisco. In the public domain. Tobacco cultivation dominated the economies of Virginia, Maryland, and other states almost from their initial establishment as colonies of England and continuing well into the twentieth century. The vast acres of land needed to grow tobacco and meet an insatiable appetite on a global scale led to the establishment of plantations worked by enslaved laborers first brought over from Africa. Sometimes it is difficult to envision that the very custom of smoking tobacco dates for much of the world only from the late 15th century A.D. Well before their sustained contact with people of European and African descent beginning in A.D. 1492, however, American Indians had cultivated tobacco. Tobacco was used as a way of communicating leadership and social status, helped strengthen ties between rival American Indian groups, and played a critical role in ritual contexts—including as part of mortuary customs. Smoking pipes date back to over two thousand years ago in North America, first taking the form of carved stone and then largely replaced by pipes made from clay. Clay is the preferred medium for pipes made by people of European and African descent, although stone pipes were made as well. The Virtual Curation Laboratory has created three-dimensional (3D) digital models and plastic replicas of smoking pipes associated with the largely prehistoric Monongahela Tradition of southwestern Pennsylvania, the Susquehannock Indians of eastern Pennsylvania, and enslaved Americans located on Virginia plantations—as well as smoking pipes made commercially in the U.S. and Europe.